This mind-blowing gallery of 16 abstract designs provides experienced colorists with a fabulous array of creative possibilities. Geometric and figurative images of patterned wheels, leaves, clamshells, clouds, and other shapes offer dramatic backgrounds for colorful self-expression. Color the perforated pages and hold them up to a light source and they will glow like stained glass. 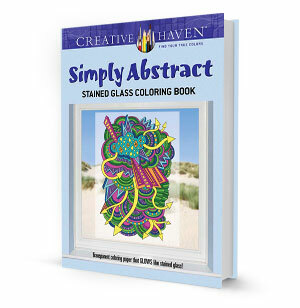 Includes 16 abstract stained-glass designs. Features geometric and figurative images of patterned wheels, leaves, clamshells, clouds, and other shapes. Transparent coloring paper that GLOWS like stained glass!